Thank you very much for your continuous use of Sony products. 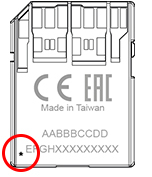 When using our SDXC / SDHC UHS-II memory card SF-M32 / M64 / M128 (hereinafter referred to as “target product”) which is on sale in March 2016 with some UHS-II compatible devices *, It turned out that the symptom occurs that the recognition of the target product is slow or unrecognizable. Therefore, we will exchange the target product free of charge, so if you have the target product, please contact us at the window below. We apologize for any inconvenience and inconvenience this may cause to you. We would like to continue to appreciate Sony products. * In addition, similar symptoms may occur also in devices to be released in the future. Please note that the target product without the following mark on the bottom left of the product is subject to free replacement. This entry was posted in Accessories, Sony accessories. Bookmark the permalink. Trackbacks are closed, but you can post a comment.